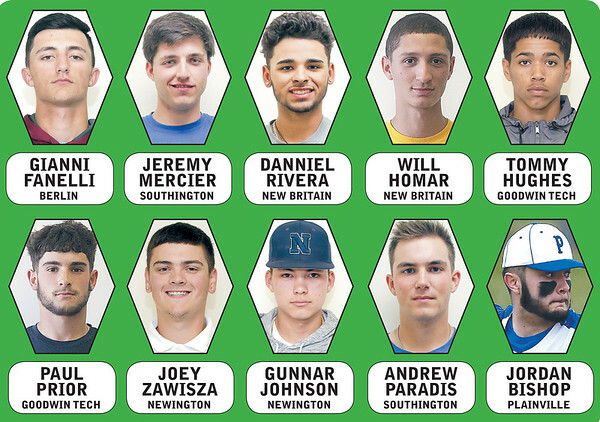 Our 2018 All-Herald Baseball Team has players from all but one area team and has a strong mix of pitching and offense that could compete and beat any group in the state. Berlin’s Gianni Fanelli makes our All-Herald team for the second straight year. Fanelli received all-conference honors this season and was selected to play in the Junior All-Star game after hitting .392 with 13 RBI and 15 stolen bases. Having made all-conference in basketball and cross country as well, Fanelli was awarded the Physical Education Award by Berlin High School. Fanelli still has one season to go, so he will be sure to build off this season and have a strong senior campaign. Plainville senior Jordan Bishop capped off his career in a big way this season. On the offensive side, Bishop hit an impressive .460 with 29 hits, 10 RBI and 13 runs scored. Bishop may have been even better on the mound, where he posted a 2.74 ERA in 43 innings pitched, while picking up four wins. His effort this season earned him all-conference honors. Danniel Rivera was crucial to New Britain’s success this season and makes our All-Herald team for the second straight year. After a strong sophomore season, Rivera did nothing but improve. He finished with a .433 average, with 26 hits, three home runs and 16 RBI. He is also in the top 10 percent of his graduating class, received honors every quarter this year, and was named Student of the Month in March. Rivera still has a year to decide on where he will play collegiately, but said he is “close to committing” to a D-I school. Will Homar finishes his career making our All-Herald team all four years he played varsity ball at New Britain. That comes as no surprise, as Homar has been a pillar for the Hurricanes ever since he stepped onto the field for the program. Homar was named all-conference for the fourth time and All-State for the second straight year after collecting five wins and posting a 0.74 ERA to go along with 47 strikeouts in 47 innings pitched. He was also selected for the Senior All-Star Game, after being selected for the Junior game last year. Homar will play at Southern Connecticut State University next season and is sure to make a quick impact for the Owls. Tommy Hughes went into the season as one of the most-hyped players in the state. He did not disappoint, producing in every part of the game. Offensively, the senior batted .397 and had an on-base percentage of .511. He also had 11 doubles and 31 runs scored for the Gladiators. He was even better on the mound, notching 103 strikeouts in just 50.2 innings. He had a 2.33 ERA, winning four games as a starter and saving three games in relief. He was named first-team All-Constitution State Conference for the third year in a row. Hughes is set to play at Southern Connecticut State University next season. Paul Prior was another all-CSC selection from Goodwin Tech, receiving honors for the second time. The senior shortstop proved to be a force on offense, hitting .494 with an OBP of .552. He had four home runs, 15 doubles, 32 RBI, 25 runs scored and had a .844 slugging percentage. He will attend and play at Worcester State University next season. Newington had the best finish among area teams, going 14-6 on the season. The Indians were led by Joey Zawisza, who proved to be one of the most versatile athletes in the area, making an impact in seemingly every facet of the game. As a team captain this season, Zawisza earned all-CCC recognition with his performance on the mound. The senior had a 7-2 record and a 1.78 ERA. Even more impressive was his 51-to-6 strikeout-to-walk ratio, proving just how dominant he can be. He will be joining Prior at Worcester State University next season. Gunnar Johnson may be just a sophomore, but he established himself as one of the best catchers in the state this season. He hit .440 and had 28 RBI, leading to an all-conference and All-State selection. Johnson has two years remaining in high school and will be a huge part of the Indians going forward. Southington’s Andrew Paradis had a breakout sophomore season, leading the team in batting average and being an all-conference selection. Paradis has also been invited to play in the Goodwill Series in Australia in December. With a squad like this, it’s only fitting to close out with a player who can do it all. Jeremy Mercier was that player for Southington. The senior made an impact from the mound and the batter’s box for the Blue Knights. He went 6-2 with a 2.81 ERA as a pitcher. As a hitter, he hit .329 with two home runs and 17 RBI. His efforts earned him all-CCC honors. He also earned honors in the classroom, graduating with a 97.6 GPA. Mercier will attend the University of Rhode Island with the hope of playing baseball as a walk-on. Posted in New Britain Herald, Berlin, Goodwin Tech, Innovation, New Britain, Newington, Plainville, Southington on Friday, 13 July 2018 22:12. Updated: Friday, 13 July 2018 22:15.